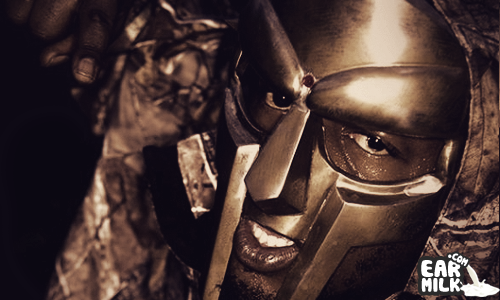 There are two incredibly badass ways rapper DOOM is celebrating Lex Records' ten year anniversary. The first is a one-off show with Ghostface Killah in the UK. The second is through a gradual compilation release called Complex, which Lex Records tells us features Boom Bip and his work on the Neon Neon project, as well as Gruff Rhys. Today we learned DOOM's contribution to this album will be a highly anticipated collaboration with Radiohead's Thom Yorke and Jonny Greenwood. All the tracks on this compilation will be released week by week until mid-January when the physical vinyl disc will drop. Until then, if you haven't checked out all the remixes of "Gazzillion Ear", now is your time to catch up. MADVILLAINZ, a culmination of Kanye West, Mad Lib and DOOM (not to be confused with Madvillain), created a remix of "Gazzillion Ear", as did Jneiro Jarel and David Sitek (don't say we didn't tell you DOOM is one of the most remixed hip hop artists in recent years). Lucky for all of us, the four versions, including the original, are downloadable below. Check back here in the meantime for updates on this ingenious slow release.